It has been nearly ten months since I’ve had to accept this new normal. It has been such a struggle. Not a day has gone by that I haven’t reflected on you and the immeasurable impact you have had on my life. I still remember the first time I was introduced to your music. It was 1995 and I was a college freshman in Evanston. I was a latecomer to the Seattle rock scene, aided by my roommates’ music collection which included several Soundgarden CDs. Little did I know then that my world was about to undergo a seismic change!! I recall the first time I played Superunknown. Mind. Blown. It was like nothing I had ever heard before, or since. Somehow, your music has a way of making me happy and sad at the same time. And upon hearing that voice – the range, the power, and the emotion. Just, wow! Untouchable. And those howling highs – how is that even humanly possible?? Your vocal energy and spirit grab me every time. But your lyrics are what I find most profound – poetic, masterful, thought-invoking, simultaneously direct while still open to individual interpretation. Immensely powerful because your words are so personal and genuine. They are sugar-coated only by your insanely beautiful singing and melodies. As a teenager discovering your music, it was like being thrown a lifeline that I didn’t yet know I needed. I struggled with anxiety, depression, and feeling withdrawn. At that age I didn’t know how to process those feelings, so I tried to force “normalcy” on the outside. Like how you later described The Day I Tried to Live. Meanwhile, I was sliding on the inside. You entered my life at just the right time; your music picked me up and carried me through my most difficult years. And in time, you helped me embrace my differences as qualities and shaped me into the person I’m proud to have become. I feel like I’ve been on a journey with you, with me always a bit behind and drawing from your courage. To me, you got it, you had it figured out, and I knew I would be doing right to follow your lead. Thank you so much for being willing to bare your soul to the world, for helping me see my own, for helping me find my way, and for giving me strength to keep on rowing. 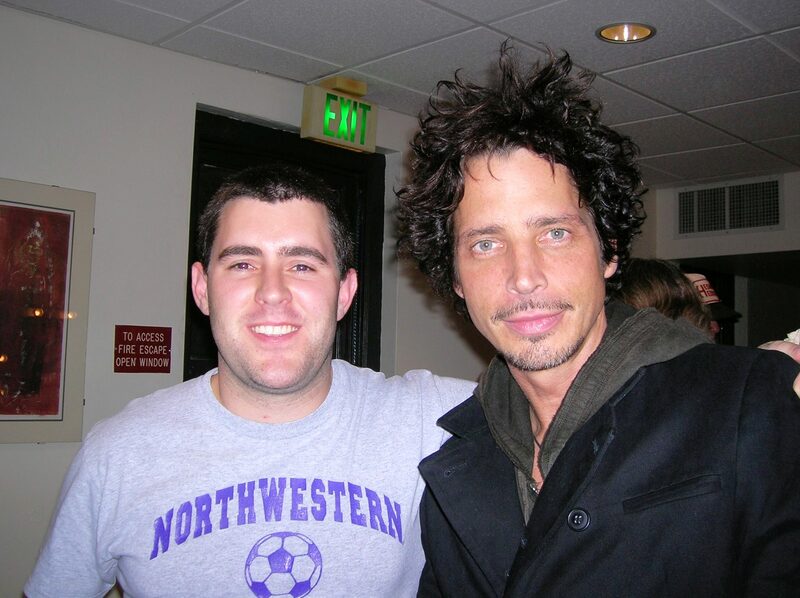 You’ve taken me on one heck of a roller-coaster – from my initial discovery of Soundgarden, to coping with the breakup in 1997, to hearing you emerge re-energized with Audioslave (Cochise was a fitting re-introduction! ), to the total euphoria of seeing your message “The 12-year break is over & school is back in session”, to final heartbreak. I was very fortunate to see you in concert seven times – the first in 1996 with Soundgarden and the last in Seattle 2014 at your fireside-like Songbook acoustic solo show. You have given me a wealth of concert memories that I cherish deeply, on top of an awe-inspiring body of music that continues to intrigue, amaze, and inspire. One of the highlights of my life was meeting you backstage after your Seattle show in 2007. My wife’s introduction said it all: “Chris, I’d like you to meet your biggest fan!” And in classic CC form, you shared your awesome sense of humor by reaching for the camera to take a picture of my wife and I right after she’d asked “could we get a picture before you go?” We still laugh about that to this day. Beyond your musical genius, I came to realize just how incredibly kind, humble, caring, and compassionate you are – to your family, to your fans, to everyone. You are a rockstar of a musician and of a human being. Your genuine spirit shows in everything you said and did. I believe, deep down, that was my draw to you all along. I am so very proud to call you my friend, my role model, and my hero. Loud Love, my friend. Thank you for giving us all you had. You are missed dearly and will never be forgotten.